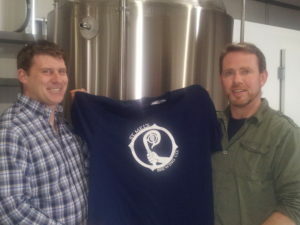 Home > News > Beerfest > Meet Master Brewer Liam Hanlon from St Mels Brewing Company. Inec Inec Meet Master Brewer Liam Hanlon from St Mels Brewing Company. Meet Master Brewer Liam Hanlon from St Mels Brewing Company. Prepare be converted to craft with master Brewer Liam Hanlon from St Mel’s Brewing Company. Longford’s finest will be well represented in Killarney this May 26 -28. St. Mel’s Brewing Company was founded in 2013 by Liam Hanlon and Eoin Tynan, the first brew went on in May 2014. I studied Biotechnology in Maynooth and then went on to study a Masters in Brewing and Distilling Science in Heriot Watt in Edinburgh. In between I worked at Dublin Brewing Company. After my Masters I went to Carlow Brewing Company as Head Brewer. We started distributing just locally, then regionally. We are now stocked in supermarkets such as Supervalu, Centra, Dunnes Stores and Aldi and are just about to ship our first container to the USA. We have 4 beers in our Core range, an IPA, a Brown Ale, a Pale Ale and a Helles Lager. We also do a seasonal range including a Raisin and Oatmeal Stout, Spring Bock, Beer Garden Wit and an Autumn IPA. We have a whole black label range planned that we can now put into action having expanded our production capacity at the start of this year…hoping to have the first of these at Killarney. It could be that there is a gap in our portfolio but usually it’s because we want to have a go at a particular style or we have had an idea we want to try out. Couldn’t pick one out, the ones that are fun to drink aren’t always the ones that are fun to brew…and vice versa! It would probably be an Eisbier because you certainly couldn’t brew it commercially with due regard to any of the above. I rarely get an opportunity to explore any more. There was a time when I could discuss, with authority, every craft beer available in Ireland but that time has passed and now there is such a diversity of style and flavours it is almost impossible to select one beer or brewery above others. Since the festival is in Killarney I will say that Killarney Brewing do some excellent beers, their Helles Lager is almost as good as ours! It has to be Carlow Brewing Company. Dublin Brewing was where I first learned about craft beer but Carlow was where I learned the business and the craft. To be able to play a small part in their success before I set out on my own was a privilege. Learn the craft and the business before diving in. Mistakes in this business are expensive. To be honest, with all the lovely people, reasonable prices, superb beer, great food and music offering and beautiful location next to all the scenery and amenities that Killarney has to offer, I can’t understand why people bother using the convenient public transport services to attend at all! All over the Midlands, good independent off licenses around Dublin, select restaurants and bars in Dublin and all good Supervalu and Centra stores, Aldi and Dunnes stores around the country.